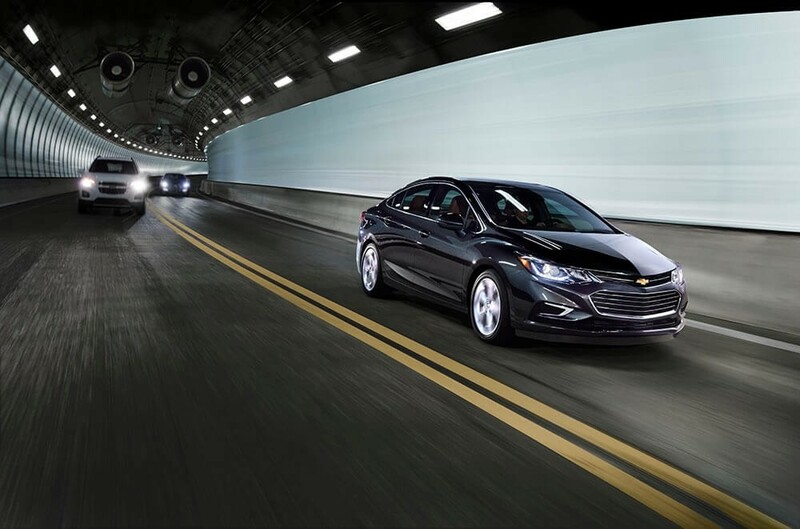 The first thing you will notice about the 2017 Chevrolet Cruze sedan is how affordable it is. The second thing you will notice is how impressively equipped this car is from top to bottom. Each available trim is packed with top-notch standard and available features. So if you want to get a great value on the next new car you drive in St. Augustine or Orange Park, the 2017 Cruze has a lot to offer. When you’re ready for a closer look, visit Nimnicht Chevrolet in Jacksonville. All trims come with a turbocharged 1.4L four-cylinder engine that produces 153 hp and 177 lb-ft of torque, and are capable of reaching fuel-economy ratings as high as 28 mpg city and 39 mpg highway. MSRP starts at just $17,850. This trim starts at an MSRP of $20,400, but it feels like a much more expensive car thanks to features like a six-speaker stereo with satellite radio, steering-wheel mounted controls, and fog lamps for superior visibility in bad weather. The top-of-the-line trim has an MSRP of only $24,350, but it comes with upscale features like supple leather upholstery, larger 17-inch wheels, a heated steering wheel, and a refined suspension that gives the car a sportier feel. Every one of the these trims comes standard with advanced technologies like a seven-inch touchscreen, Apple CarPlay and Android Auto, and a rearview camera. However, you have the option to upgrade to an eight-inch touchscreen, add a nine-speaker Bose stereo, and drive with an LCD instrument cluster. The safety of the car can also be upgraded with advanced features like automatic headlights, forward collision warning, rear cross-traffic alert and more. It is not an exaggeration to say this car is one of the best bargains you will find in St, Augustine, Orange Park, or anywhere for that matter. We have a wide inventory of Cruze models waiting for you to explore at Nimnicht Chevrolet, along with financing for more drivers. Head to our location east of I-295, and contact us if we can answer any questions in advance.